8-13-03 – Be careful what you plant. Gardening only remains a soothing, serene pastime up until the point when you let your guard down and allow the first invasive perennial onto your property. After that, all hell breaks loose. I was ravished early on. My first experience with an evil, plundering, godless Plant That Will Not Die occurred in only the second year I tilled the earth. 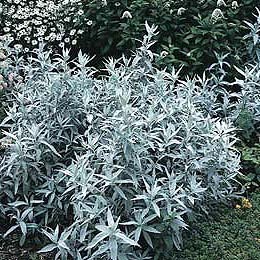 The fiend wasArtemisia ludoviciana ‘Silver Queen,’ commonly White Sage, or, as soon renamed by me, Silver Zipweed. I had purchased three of the little darlings the year before, from a reputable nursery, a nursery that should be surrounded and stormed and burned, the principals handcuffed and taken into custody by federal Department of Agriculture agents, for knowingly selling me those plants. The first year in my garden the three small specimens looked fine, nearly bashful, their slender, silvery-white foliage contrasting politely with all the other new plants. But the next spring, whoosh! ‘Silver Queen” leapt from the ground everywhere, each plant having unleashed apparently hundreds of clandestine, underground stolons (rooting stems) the season before. Particularly unnerving was the way these demon offspring would not only fling dirt as they shot up, but then spin around, eyeing just how many plants behind them they could attack and rule. It was clear this ‘Queen’ was interested in reigning over far more territory than the meager patch of garden bed I had allotted. Poland, perhaps. I never did eradicate ‘Silver Queen.’ I dug, I ripped, I pulled it out unsuccessfully for years. It always came back, in an ever-widening circle, in the lawn, the window wells, the dog pen, the strawberry patch across the street. Eventually it just left, disappeared over the horizon, at the approximate speed of a prairie fire. Those of you similarly cursed by the Queen, my only advice is patience. That and never trust a plant with hairy leaves. I was lucky and warned about Goutweed early. I was chatting about groundcovers with a long-time gardener just after moving in to my first house. New to gardening, I was working hard to impress him with my tremendous knowledge of plants suitable to various predicaments. I mentioned a stand of cedars the previous owner had neglected, and how I would be removing the thin lawn and weeds that struggled in their dappled shade, then planting Aegopodium. He gave me a disgusted look, snorted air through his nose, and said, “Oh, no. You don’t ever want to grow that weed.” I took him at his word, at the time not realizing the great favor he had bestowed. People have abandoned homes in the Twin Cities and moved to Zimmerman because of this plant. 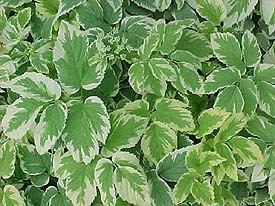 Worthy plants such as Lamium, Ajuga, Hosta, and Chrysanthemum are divided in spring and passed along between neighbors as the valuable addition to a garden that they are. Goutweed moves through a community like head lice, naïve homeowners spotting it in a neighbor’s yard and politely inquiring if they can come over sometime to fetch a little clump. They are never refused; take all you want, please! Ten years later, they’re down to two choices: a realtor, or Roundup. Any readers who may have caught the program and purchased the plant, my sincerest apologies. I wasn’t entirely talking through my hat; at the time, I was a new, avid grower of Houttuynia. How was I to know that after several seasons of establishing a secure base, Houttuynia goes Viking, pillaging through the garden and overrunning the root system of every perennial in its path? This latent tendency to explode off the starting line after demurely idling its engine for a few years caught me by complete surprise, I assure you. If you so far have been spared assault by any or all the above, there’s no reason to feel smug. 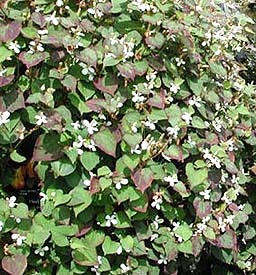 There is one invasive plant, of course, that either has or inevitably will make your acquaintance: Glechoma hederacea, much, much more commonly known as Creeping Charlie. It is the perfect subversive plant. It’s even misnamed – Charlie doesn’t creep, it hurdles. Slender stolons from a single base plant shoot out in excess of ten feet per season. The plant flourishes in sun or shade, drought or deluge, clay soil or loam. It’s hardy from Houston to the Hudson Bay, produces and drops seed half the season, and you can’t kill it with fire. Now there’s good design. After all, nurseries knowingly sell us Goutweed. They must be kicking themselves that they aren’t able to sell us Creeping Charlie as a groundcover, in flats, and a pricey one, at that.